Last month, Solid Ground produced a free, family-friendly Christmas event at local Norwich retail centre, Anglia Square. Taking place in the heart of the shopping centre, “Santa Claus is Coming to Anglia Square” saw visitors flood to the centre for their chance to meet Santa in his grotto, receive a small gift and tell him what they want for Christmas, …And of course get that awkward festive snap! After feedback from previous events at the centre, we decided to make the first hour of the Grotto specially allocated for Children with Autism. Allowing parents to pre-book and giving them extra time for their visit. This meant individuals were able to enjoy seeing Santa in a calmer, quieter and Autism-friendly environment. 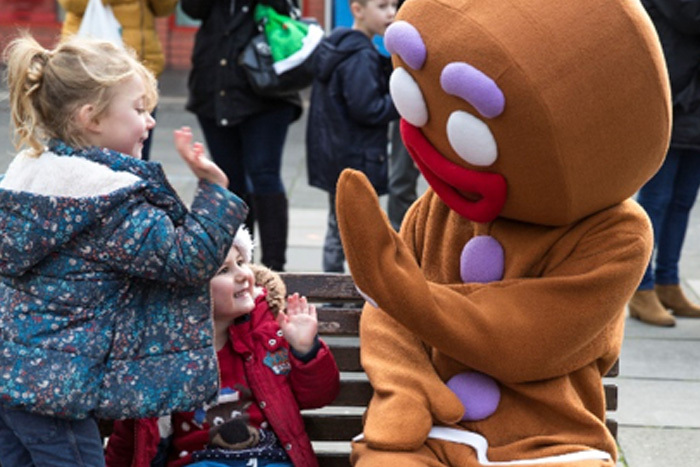 Following the Autism hour, as families queued to see Santa Claus, The Grinch and the Gingerbread Man entertained waiting children who spoke to the characters and enjoyed taking pictures with them. The characters were fantastic at entertaining children, and adults alike! All visitors paid a small donation as way of entering the Grotto. The recommended was 50p per child, and all profits went to the children’s charity Break, for vulnerable children across East Anglia. In total a fantastic £251.54 was raised on the day and donated to Break just in time for Christmas, and visitors on the day had the chance to tell Santa their Christmas wishes before the big night.